I am with you Alfa, the car definately looks better with that sleek roof. Alan, I assume that they made it in LHD also for export. Were these cars ever exported? Yes, they made LHD models and many of these were exported to the USA. Shin Yoshikawa's book gives details on the export market cars and where they were originally sent to. There are some serious 2000GT collectors in the USA. Some of the Shelby-run race cars still exist - in the hands of USA collectors I believe. We used to have a few here in the UK. 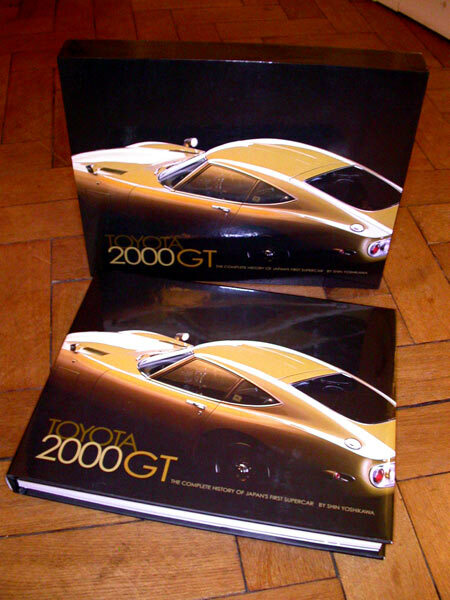 One of them originally belonged to 1960's fashion model 'Twiggy'; it was given to her by Toyota as a present for promoting the 2000GT in Japan. That car eventually went to the States I believe. Almost all the other UK cars went back to Japan over the last decade or so, and there are only a handful left over here now. Alfadog, I couldn't agree more with you about the convertible. It just looks wrong. 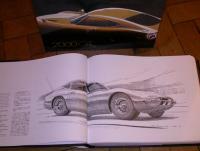 In japan, a crassic car magazine"Nostalgic Hero" intoroduced a serious U.S.collector for 2000gt in some years ago. He has 5 or 6 GTs and even rare 2300 GT which was never sold in Japan.I think this is a same way of S30,2000cc for japanese model but for export model,much more torque 2400cc. Toyota and Nissan's both engineer thought same way. "Need a big displacement engine for american market"
I forgot to mention,2300GT does not have a DOHC engine like a 2000GT.2300GT has a OHC engine. Like a Z432 has a DOHC and a 240Z has a OHC. 2300GT!!! Wow! You learn something new every day. Thanks for your input Kats. I found a picture of the 2300GT... different grille, door mirror, and some kind of scoop underneath the front. Anyone else want to play spot the difference? Thanks Kats for the great information. Was the 2300cc engine a toyota or yamaha design? Was the 2300 only made for export? Anyone else want to play spot the difference? Okeley Dokely then... the Rear tail light or indicator appears to have a faired-in nacelle which does not appear on the 2000. Take a close look at Alan's pics earlier in the thread and you'll see a navy-blue tail-end infront of the white ragtop which has the same feature. Maybe Alan was racing against a 2300GT without knowing it.. 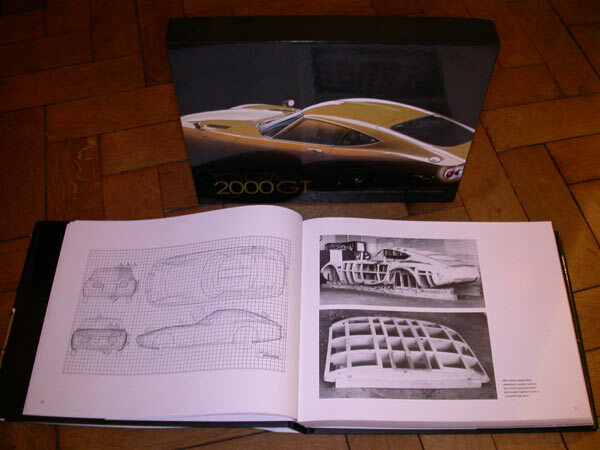 The 'normal' production Toyota 2000GT was coded "MF10", and this model was made in both RHD and a few LHD layouts. Right at the end of production of the MF10, Toyota had a try at making something more suitable for the USA export market. This was coded "MF12L", and it is this model that carried the bodywork and trim differences that can be seen in the photos, although the chin scoop was also seen on some MF10 cars that ( like the MF12L ) were fitted with air conditioners. The engine of the MF12L was the Type 2M-B ( an SOHC 2.3 litre design that was usually fitted to the Crown R ). This engine produced 10BHP less than the DOHC 2 litre type 3M, but gave 18lb-ft more torque. The MF12L was heavier than the MF10, and had a lower top speed. Toyota figured that the SOHC engine would be less of a challenge for overseas dealers to service and repair, and the extra torque and unfussed power delivery of the bigger engine would be better suited to the requirements of the USA market. Less than ten MF12L models were actually built. Toyota realised early on in production that a cheaper version would be better suited to the USA export market, and developed a prototype called the "390A". One of the first things to be binned was the complicated and expensive retracting headlamp system, to be replaced by an incongruous pair of bugeye lamps, and the other front and rear lamps were also changed to suit coming USA laws. The dash was simplified into a one-piece plastic moulding, and many other cost-saving efforts were made. The 390A was - perhaps mercifully - never approved for production. Kats, that USA collector you mentioned is probably Mr Craig Zinn of Florida, who has a big collection of the cars. Bob Tkacic and Peter Starr are I believe the USA's most prominent 2000GT specialists and restorers. I can't recommend the Shin Yoshikawa book highly enough. It costs a fortune, but in my opinion its worth every penny. 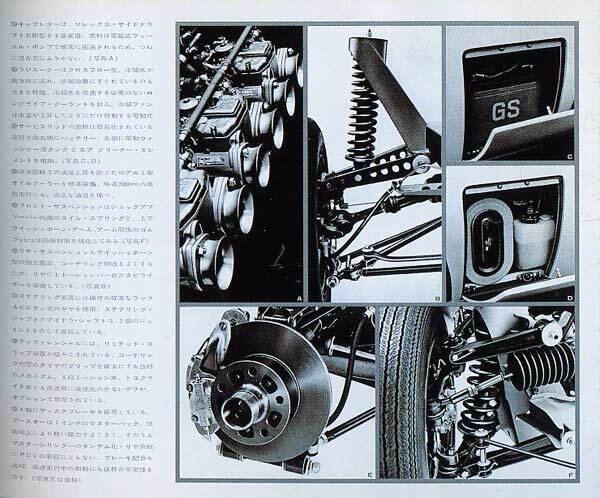 ps - I forgot about the Handbrake / E-Brake on the Toyota 2000GT. An umbrella handle sticking out of the dash. Bloody awful thing to use! The door handles look alot like (if not identical to) the ones that were fitted to the 1970-1977 toyota celica. I guess some design elements lived on. You never sieze to amaze me with your knowledge on vintage Japanese cars Alan. That goes for you too kats. If its too expensive for you, at least try to get a good look at it in a bookshop or library. The prototype and racing sections are fabulous. I know you like that side of the story. One day I'd like to see a book of the same depth and quality on the S30-series Z. Unfortunately, the situation at Nissan and the fact that many of the major players in the story are no longer part of the organisation means that this will probably never happen. DriversDoor Inc. produced the book. Maybe its cheaper in the USA than it is in Japan ( where I bought it ). Hello kats! Good to "see" you again! Great conversation. What is the panel behind the front wheel well about? I've been harping on about this book so much that I thought I should give you a peep at what it looks like. Nice to see you and I come back! I can see the lunch box and the bottle of fresh juice,nice to go for a picknick. selling two 2000GTs.Both aproximately $150,000 U.S. but they are very very old,I can not understand who wants to pay for these. In my opinion,they are the same condition as $3,000-4,000 U.S. I hard at that time(60's)YAMAHA wanted to make cars and be well known as a high technical skill company.So they approached car company like NISSAN and TOYOTA. Some my friends said TOYOTA's DOHC engine can be said truely made by YAMAHA so the tapet cover should have YAMAHA on it not TOYOTA. And one small thing,the cigarett lighter is equipped on the interior door panel.That is cool, is not it? The small front fender emblems are well costed,how do you say"shippou-yaki"in english Alan?The emblems are like cloisonne brooch. 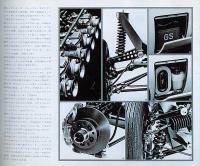 Many japanese journalists say 2000GT's chassis and suspention systems looks same as Lotus Elan.2000GT is not unit-body. The styling is very low appearance,no reason,I just feel it is cool.I remember Mr.MATSUO wanted to lower the 240Z's roof about 3inch less than production model.If the 240Z had lower roof,would it be nice?I do not know.Mr.MATSUO argued with Mr.UEMURA (who was a chief of chassis and mechanical design) again and again and again about the hight of 240Z.Mr.MATSUO wanted lower,Mr.UEMURA wanted higher.Finally both yielded each other.240Z's roof hight is a compromise result. "Shippou-yaki" ( can be read as 'seven treasures ware' ) is the same process that we call 'Enamel' in English. Originally it was a process used in jewellery making, but automobile makers used a simplified process in the 20th Century for their emblems and badges. I understand what you mean, Kats. The emblems really are finely made - like a piece of jewellery. That X-shape chassis is very similar to the Lotus design. It is well-known that many car makers around the world took notice of what Chapman and his staff were making. But maybe if they started their design process a few years later, Toyota and Yamaha would have opted for a unibody design. That might have made it a lot cheaper to make, and a lot cheaper to sell. In that case, it might have been a bigger seller - especially in export markets. Yamaha started a long relationship with Toyota, especially for their engines. I used to help out on a friend's Formula 3 racing team back in the early 1980's, and at that time they were using Toyota twin-cam four "Novamotor" engines. The cylinder heads had a casting mark on the front, reading "YAMAHA". Nice to have you back, Kats. I flew ANK from KIX to Kochi last week, and I was thinking about asking the pilot if he knew you!. Hello to all, especially our friends over seas! I am always intrigued at how so many of these post are contributed by so many different countries... the internet, what a concept! I too find the Z to be my cup of tea, I really am a jeans and t-shirt kinda guy. But I do respect and admire the Toyota 2000GT. I am also thankful that the Toyota played out the way it did so that it could be an object of admiration yet so distant to ownership as opposed to the realtively available Z cars. At least this way I know that a Z is within my grasp! Hey Kats! In the US we are quite aware of the wonderful products that Yamaha has produced for many years. I am a fan of their home audio equipment, like a Z quite a bit of Bang for not a lot of Bucks. Outstanding motorcycles and snowmobiles too! Yamaha R1, very awesome! Alan! How are things on your side of the pond? I'm glad I read all the replies before posing the question that has bugged me for sometime... those darn panels between the door and front wheel! Battery compartment, nice and low... good idea from Toyota. Oh geez, Alan, Kats, thankyou so much for sharing your knowledge!! I know it might be a long time before I can really afford to buy THAT book. You weren't kidding when you said it was expensive, Alan! A question about the air filter box... is that just a spare one held in the storage container? Wouldn't it be cool if it was a little esky, to keep that Japanese beer in on long journeys!! Again, thanks for everyone's input. I love it! Thanks for a most engaging post on another of my favorite cars of all time. Regarding Mr. Zinn of Florida; I believe he was the subject of an article that appeared in Sports Car International a few years back. The photography was spectacular (as usual for SCI) and as a retrospective it was well written too. 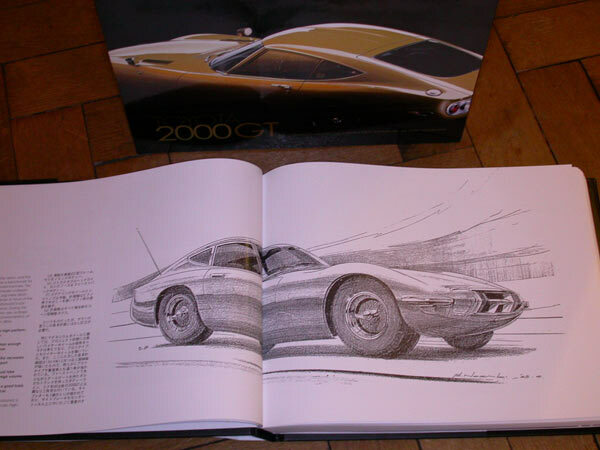 When Mr. Zinn was mentioned it was stated that he owned two 2000GT's, one of them being a single overhead cam w/ automatic transmission (a 1970 model if I recall). As an interesting aside, Road and Track published an article in the late 1970's which mentioned that one of the executives at Kearny Mesa Toyota of San Diego used to drive one of the ex-Shelby prepared cars to and from work everyday and would smoke a tobacco pipe whilst embarrasing many "high performance" cars. The car was painted a striking silver with a black band in the midsection. The car was about 46 inches tall from the factory and the ex-Shelby car was approximately 1.5 inches lower! One of the other board members at Kearny Mesa Toyota also owned a completely stock 2000GT that was only driven in good weather. The article also appeared in Road & Track's Toyota 1966-1984 compilation soft cover book. If only Toyota would produce a modern interpretation of that design. Regarding the "cloisonne" emblems it is also somewhat related but, AMCO used to market a shift knob that you could purchase at the dealer's parts department to dress up the somewhat somber interior of a 280Z (we didn't get a fancy wood like shift knob like the 240Z). I have just installed a new in the box AMCO shift knob in my latest '77 280Z and it has a unique finish which compliments the interior. I was given the email that you mentioned by a fellow Z club member and it was sent back by the web postmaster so it may have been shutdown? Thanks for your great pics of the meet! Is the book published in Japanese? If so, it is not a problem as I have a Japanese friend who has kindly offered her time to translate. I never cease to be amazed at the depth of knowledge you have attained regarding the Z's early development phase. I wonder how the lower roofline would have looked? thanks to everyone who remembers these great cars. My daughter has a yamaha flute, and my Ford Taurus SHO has the wonderful Yamaha built V-6. Dual overhead cams, 3.0 litre, 4 valve per cylinder 220 hp. An absolutly fantastic engine! Thanks for the informative thread. I've seen a couple of the 2000's, one at the montery historics, the guy had it running, sounded sweeeeet! I wonder how the lower roofline would have looked? Just quickly did this... its an animated gif so you can see what it looked like before and after. It's only a couple of inches shorter but the difference is noticeable. Maybe on a different angle would be better..